John suffered a traumatic brain injury and significant damage to his left cerebral hemisphere inhibiting the voluntary use of his right hand and arm. “At the time of the accident, the doctors told us he would be in a vegetative state if he lived,” Nova said, adding he had been knocked unconscious and his right hip, knees, and pelvis area were crushed. John’s recovery was better than anyone expected. While he had 12 operations to repair his right hip, knees and pelvis, his mind was clear and strong. 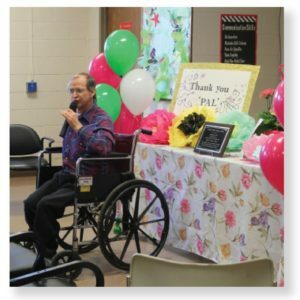 While today he is able to walk slowly with the use of a cane, while working at SubCon he self-propels using a wheelchair for safety. He likes his job at SubCon where he has worked for 22 years, often lidding mugs and rewrapping jewelry. “SubCon is beautiful,” he said, adding he is often called on to offer a song or poem for a special event or someone’s birthday. Most recently, he offered a profoundly beautiful poem spontaneously in honor of the late Barbara Reid at her memorial birthday. Lately, as Nova is getting older, she wanted to ensure John would continue to have the support she has always given him. In September, thinking more of her than himself, John decided to obtain services from Medicaid Service Coordination. During an initial visit in his home, it was discovered that his bathrooms – one on the first and another on the second floor – were not properly equipped with handrails. “Due to Nova’s age and declining health, she is unable to assist john in the bathroom,” Molly Martinelli, his MSC, wrote in her application to the Foundation for funds to install handrails. The Foundation responded quickly and by October the handrails were installed. Due to Molly’s compassion and support of The Foundation, John and Nova now have greater mobility and safety through the use of handrails, allowing John to get around without leaning on Nova. And, Nova has the assurance her son will be supported as she becomes less able to help him.